All our AIRcable OS products are based on the AIRcable operating system. It allows running customer applications in BASIC. They are easily programmable over air through a wireless file transfer (FTP) of a simple text file containing the BASIC code. Our AIRcable OS products are the only embedded Bluetooth products that allow multiple and simultaneous wireless connections. In fact, two serial wireless connections (SPP) can be supported at the same time plus file transfer and message transfer. A very powerful input and output system implemented within the AIRcable OS allows reading and writing on 3 high speed serial ports: SPP master port, SPP slave port and the UART. 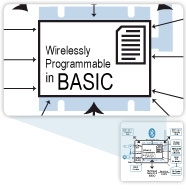 Applications run independent of wireless connections and can communicate with sensors and attached devices or user interfaces. The AIRcable Industrial has an additional read/writable file system for data logging and retrieval using standard wireless FTP over OBEX. The interoperability allows even cell phones and PDAs to access the file system wirelessly. The AIRcable OS products come with a number of intelligent sensor interfaces: real time clock, temperature sensor, high-precision analog to digital sensor, LCD and more. This makes the AIRcable SMD the perfect solution for "smart dust", motes and other wireless sensor products. It is mesh network capable, bootstrap configurable and able to support master and slave operations simultaneously. interoperability with any PC, laptop, cell phone, PDA, GPS etc. Multiple sensor interfaces, ideal solution for "smart dust" or "motes"
Three connection half-duplex communication ports, two are wireless the other one is an standard DB-9 RS232 compatible UART. Revolutionary in design and function, the AIRcable OS products unite three cutting-edge technologies — programmable, autonomous mesh nodes (motes), with data loggers and industry-standard Bluetooth® 2.0 compatibility. Based on our AIRcable operating system, these versatile devices gather data using intelligent sensors, run computations, transfer files, and communicate using Bluetooth technology. These units can be clustered together to create a low-power, highly flexible mesh communications network that can interact with other nodes and with other Bluetooth compatible devices such as PCs, cell phones, laptops, and handhelds. The communication diagram illustrates how our unit interacts with other devices, with the environment, with applications, and with the user. The AIRcable Industrial is an intelligent, autonomous device that can be programmed wirelessly for any application written in standard BASIC - with no code compiler required. You can also access sensors - internal sensors, or those hooked up to the unit's built-in serial port - through your application program. Wireless data streaming ports for an uninterrupted flow of information. Another unique feature is its ability to manage up to four simultaneous connections, including: file upload/download, send/receive messages from other devices, and send/receive streaming data. Since there are two ports using SPP, both are able to send and receive data. It's much like conducting a conversation with another person. The master, or outgoing port, establishes connections with other devices. The slave, or incoming port, accepts connections. Because the master can connect to another unit, data can be forwarded on to a central location. By using the master, you can connect to another unit through the first unit, which can then connect to another unit, and so forth. This chain of AIRcable Industrial units forms a range extender within the network of units. Flexible communication options through mesh net interoperability. The AIRcable OS is an extremely versatile communication tool. Because it uses the OBEX (OBject EXchange) communications protocol, it can transfer messages such as vCard contact information, vCalendar schedule entries, vNote for Palm/PC, and even applications to other Bluetooth devices such as cell phones, PalmPilots, PCs, or notebooks, or to other AIRcable units. When grouped together or with other Bluetooth compatible devices, AIRcable OS units form a powerful wireless mesh network. For example, vintners can use cell phones to communicate with AIRcable OS units and obtain information about air temperature and soil moisture levels. Retail stores can send coupons to potential customers who pass in front of their store while talking on their cell phones. A built-in read-and-write file system lets you store, access, and work with data anytime, anywhere. The device's on-board file system allows you to run BASIC programs and store information gathered by its data-logging function. For example, data streaming in from a sensor connected to the serial port can be loaded directly to its file system. You can access the file system from a PC or your cell phone wirelessly. Best of all, the unit doesn't have to be connected to another device for the file system to work. It performs operations in both connection and autonomous mode. For detailed information on the file system, check out the AIRcable Industrial Programming Manual. It's durable, rechargeable, and more. The AIRcable Industrial has a battery-backed real-time clock, a built-in temperature sensor that you can access via the application program, and an antenna port with various indoor and outdoor antenna options for an extended range of up to 28 miles. The devices have a large rechargeable battery and a wide-range charger for wired and solar power panels. The unit can be powered up through the RS232 interface. Enclosed in an aluminum case, the AIRcable Industrial unit is designed to withstand most adverse environmental conditions. Weather-proof versions are also available. Using another Bluetooth compatible device, such as a PC or a PDA, the AIRmote can be detected and will, by default, display the OBEX FTP profile and the OBEX item-exchange profile. 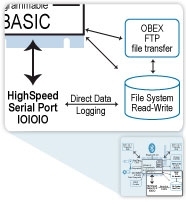 The OBEX FTP allows users to access the file system and to configure the AIRcable OS device. AIRcable.bas file contains the BASIC program that runs on the AIRcable OS. While config.txt is the persistent configuration used initially to configure the radio. In config.txt, further configuration can be disabled. It can be used to allow or prevent upload, download, and any changing of these two files. The OBEX item-exchange profile is used for communicating with other AIRcable devices using message and for business card exchange. For further details, see Part 3, Message Passing. The file config.txt contains the configuration of the AIRcable OS. This file can be also downloaded from the AIRcable to the PC so that PC users can view the configuration. It is mainly used to upload from the PC to the AIRcable so that the user can configure the hardware and the Bluetooth radio. The config.txt file has a specific format. The configuration is a set of lines containing an address and a string of 16-bit hex numbers. The first hex number starts with "@" and the address of the configuration parameter. Then the syntax requires a space, an equal sign, and another space. A number of fixed 4 digit hex values follow. 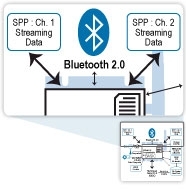 Bluetooth sniff parameter definition Sniff interval and sniff window, maximum, and attempts are specified for power saving modes during a valid Bluetooth connection. The parameter are in number of slots. // sniff max, min intv, attempt, timeout @0002 = 0150 0050 0002 0028. NOTE: In the current version, these parameters cannot be changed. 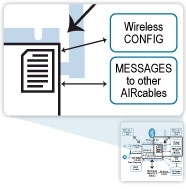 The AIRcable OS always requires a pass code or PIN the first time a connection is established. PIN codes are required for all incomming and outgoing connections, SPP FTP or OBEX. Authenticaton cannot be disabled. There are 3 levels of response on PIN code requests depending on the configuration. Unconfigured: When the AIRmote is unconfigured (for example, after a firmware upgrade and no config.txt and no AIRcable.bas program has been loaded), the PIN code required to access the AIRcable is fixed at "1234" - very unsecure. Configured:After config.txt is uploaded, the PIN code is the PIN code configured in config.txt. If the PIN code length in the config.txt file is zero, it will default to "1234" as well - a bit unsecure if the ObexFTP server is active. Programmed: The BASIC program can also respond to PIN code requests. The application knows who is asking for the pass code and can respond accordingly. If a BASIC program responds to a PIN code request, the PIN code used is the result of the PIN_REQ interrupt routine of the BASIC program - the most secure solution, even though ObexFTP server running can make it unsecure as Configured. A correct PIN code response leads to a successful pairing. The pairing mechanism allows access. A successful pairing stores a unique link key on both partners. The link key is stored automatically as the pairing information for the two partners. Matching keys then allow access to all wireless channels. This pairing data consists of the Bluetooth address of the partner and its calculated link key. Both have to match before access is granted. If for some reason the partner's link key is removed, the pairing information will no longer match and a new pairing must be established. For added security the new pairing information will not be updated automatically. Instead of asking for a PIN code again, the connection attempt will fail. To reestablish pairing, the AIRcable pairing information can be deleted. There are two ways to delete pairing information: delete all stored pairing information or delete individual pairing information. A line containing the keyword @UNPAIR in the BASIC program will erase all pairing information, just as @ERASE deletes the BASIC program. The first device paired with is the default device. The pairing information of the default device can only be removed by deleting all pairing information. The AIRcable can store the pairing information of 8 other Bluetooth devices. As more pairing is added the oldest pairing information is deleted. Paired devices can be removed in the BASIC program via the built-in function 'unpair bt_addr'. All pairing information is removed with 'unpair 0'. After removing the pairing information a connection attempt will ask for a PIN code again. Access to the configuration files AIRcable.bas and config.txt in the file system can be restricted. If bit zero of the first entry in place @0006 is set to one, the two files are invisible. It is not longer possible to download or upload new configuration files. Access to user files in the file system is still possible. Access to the file system service (Obex FTP) can be blocked completely. If bit 2 in the first entry is set to 1, the FTP service will not longer be available. No files, and no configuration can be up or downloaded. The Obex FTP service is not longer available. The service to exchange objects such as business cards, vNotes, messages etc. (Obex Object Push) can be disabled as well. The AIRcable can no longer receive messages or business cards from other Bluetooth devices. Set bit 3 to 1. See chapter UNLOCK for information about unlocking the AIRcable. 0x40 registers DUN profile when slave is called. 0x20 registers SPP profile when slave is called. 0x01 invisible files in E2FS. 0x01 erase protect BASIC, when stack overflow. This two groups allows you to take control over the FAT file system processor. The AIRcable normally is discoverable. This means that other Bluetooth devices will be able to find the AIRcable. The AIRcable provides its name and available services to anyone who can find it. Using the slave function the BASIC program can control the discoverablility of the device. All profiles are affected by this mode even though only the slave function controls it. Even after the timeout the inquiry scan is still off. Only a positive value in the slave command will restart inquiry scans. By setting the number of seconds parameter to a negative number, the AIRmote will become undiscoverable. Even after the timeout the inquiry scan is still off. Only a positive value in the slave command will restart inquiry scans. After that time, the @IDLE function is called and the slave function can decide to make the AIRcable discoverable again or not. As long as an external device knows the Bluetooth address a connection can still be made. Whether the AIRcable is discoverable or not, it will still require a successful authentication to grant access. It may be necessary for several reasons to unlock the AIRcable once some of the security measures are implemented, or to disable the execution of the BASIC program. Once you lose access to the configuration, there is no way wirelessly to enable configuration again. Certainly a special BASIC program can reenable access again, but that program must already be installed. Security PIN code is set to default "1234"
This way the configuration and the BASIC program can be updated. Once uploaded the AIRcable has to be switched off, the unlock jumper taken out and the AIRcable then switched on again. If the jumper stays in during reboot, the configuration and the BASIC program will be erased. On the AIRcable SMD the unlock pin is called SEC or security overwrite. 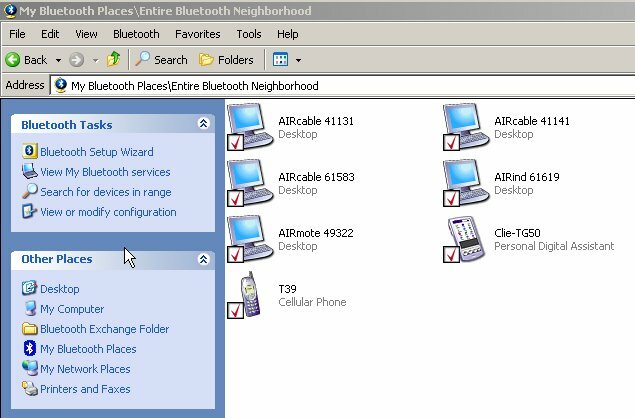 Start Bluetooth with "Explore my Bluetooth Places" by clicking on the Bluetooth B icon on your desktop. Click on "Search for devices in range". You see the services the AIRcable Industrial provides. Double click on the OBEX FTP to see the files. It will ask for a PIN code. It is "1234" by default. You must be able to see files using the Bluetooth OBEX file transfer on the AIRcable Industrial. #Drag and drop the upgrade AIRcable.bas program onto the file. The file name must be AIRcable.bas. Do not rename. Click OK to overwrite the existing program. The download will stop for a few seconds after 53 bytes. This is normal if the BASIC program contains the instruction "@ERASE". The BASIC memory will be erased before the application download. Download speed is about 200 bytes/s. Start Bluetooth with "Bluetooth" by clicking on the Bluetooth B icon on your desktop. Click with the right button over the orange big spot in the middle of the screen and then choose general search. Drag and drop the upgrade AIRcable.bas program onto the file. The file name must be AIRcable.bas. Do not rename. Click OK to overwrite the existing program. Integer Variables are indicated by single capital letters A through Y. Twenty-five variables (A=1, B=2, … Y=25) can be used. The variable named Z is reserved for specialized debugging, and is described later. Variables are not initialized when a program starts. They are initialized when the AIRcable OS reboots. Integer variables are 16-bit signed numbers with a range of -32768 to 32767. String variables are indicated by $ and a number, such as "$5". These string variables are actually the BASIC command lines, meaning that "$10" is the 10th line of the BASIC program. String variables are persistent. All changes to the string variables are written back to the memory into the BASIC program itself. This way an application can have initialized strings stored in BASIC lines. It is also possible to write a BASIC program that can change itself dynamically, such as download programs or self-configuration programs. $0 is a special variable. It is volatile and not stored permanently. $0 is used for delivering results to and from built-in functions and interrupt routines. For example, writing to a file in the file system will write the content of $0 into the specified file. $0 variables are longer strings. In this version, $0 has a length of 80 characters. See the use of the PRINTV functions to create longer strings. An immediate string is put in quotation marks, such as "hello", as a value to initialize a string variable. Immediate strings have a limit of 31 characters. Write "A" in the first character of the string. The AIRcable's central execution engine is programmed in an embedded and enhanced BASIC language. The program can be uploaded and downloaded via OBEX FTP over air. The BASIC program contains BASIC lines. Each BASIC line starts with a line number from 1 to 1023 (or 2047, depending on the configuration) followed by a single space. No spaces are allowed before the line number. A BASIC line can be up to 31 characters in length -including line number, spaces, commands and all punctuation. Except for line 0 which is special and non transient that can take up to 80 chars. Each BASIC line contains one BASIC statement. The expression parser in the BASIC interpreter is recursive. Be careful when using complex expressions. Stack space is very limited. The following expressions are evaluated in the ranking below. "expr" is used to indicate an expression. Note: Integer variables can be used for Boolean expressions as well. A zero is treated as false; a non-zero value is true. Note: string variables cannot be used in expressions. Instead, string index variables should be used at this time. String variables cannot be compared using this mechanism. There are built-in functions available to do that (e.g., strcmp). Included since OS version 30. BASIC program statements must start with a line number following a space. Line numbers go from 1 to 1023 (or 2047). The execution is faster when the line numbers are adjacent, with no empty lines in between. The BASIC interpreter executes lines with a default duty cycle of 10 lines per second or actually a delay of 100ms between the lines. This gives the other parts of the system CPU time, such as the Bluetooth baseband functions or the sensor-read functions. If a statement ends with a ';' the execution of the next line continues without the delay. This way, a speed of about 200 lines per second can be reached, but no other functions (such as Bluetooth operations) can be executed at that time. All statements are indicated by capital letters only. In this case expr has to be an integer value, or WAIT will return immediately. The wait time may not be accurate. It is possible that a WAIT is interrupted and that execution will commence earlier. To write applications with a time-controlled repeated execution, you can use either the sensor-reading interrupt routine or the alarm interrupt routine and configure the time between readings (see part 3). The substring assignment will copy the string from the position given with the substring argument into the assigned string. For-loops are indicated in this syntax. Six loops can be nested. The variable controlling the number of iterations must be an integer variable between A and F.
Subroutines are called by the start line number. To return from a subroutine, use RETURN. To jump to another line number, use GOTO. If the first expression evaluates to non-zero, the execution continues at the line number that is the result of the second expression. Otherwise the execution continues on the next line number. If you need to make a IF - THEUse GOTO to complete this part. This sequence will output the integer representation of the second character to the UART. In this case it will print "65" $5 = "HALLO"
Sends the string "ME" to the UART. PRINTU "ME"
A string terminated with CR. For the UART channel, a defined number of bytes can be input as well. Note: Input into a variable reads a number of digits from the input channel until a CR (Carriage Return) terminates the input. An input into a string variable reads in a string from the channel until a CR (Carriage Return) terminates the input or until the number of characters typed in reaches 32 characters. If $0 is used as the string variable, the limit is 80 bytes. The UART command reads a certain number of characters from the UART channel into the global string $0. The variable given to the UART command contains the number of characters. This command will not echo or process any input on termination. The UART command puts the number of bytes read back into the variable given as the parameter. You can read as much as 80 chars which each call to UART. Note: * Since version OS version 30 two new commands had been added to the OS, those are GETU, GETS. GETU is exactly like UART while GETS is like UART for the Slave Port. GETM will be available soon. By default only INPUTS will process input characters. It will echo incoming bytes and will honor back space to delete the previously typed character. But each channel can be configured to change default behaviour by using STTYU STTYS or STTYM. By default the various INPUT commands will wait indefinitely until the terminating condition is reached. During this time, no interrupt routines are processed. You should make sure that interrupts such as ALARM, inquiry results and PIN code responds should not happen while you wait for input from the user. 10 PRINTS "type 0 to terminate"
The CAPTURE statement is a way to log data from the UART to the file system directly. This command is available on AIRcable OS with file system. The "expr" parameter specifies the number of bytes to be logged. A file has to be open for this function to work. CAPTURE does not close the file. This example logs 100 bytes from the UART into a file with a 60-second timeout. 100 A = open "log.txt"
105 PRINTS "done, size "
A line beginning with REM is treated as a comment and not executed. The line is indeed stored in the BASIC program occupying program space. A possible practice is to start the line number with 0 to have the line not stored in memory but still have comments in the original BASIC file. Interrupt routines and functions are built-in and cannot be changed. An interrupt routine is executed only in response to a specific event. Built-in functions are called as an assignment to a BASIC variable. Commands are executed as a normal program line of code. Capitalization is fundamentally important as the interpreter will not generalize. "A" and "a" are not the same character. Interrupt routines are preceeded by @ and are Capitalized. Functions are NOT capitalized. Commands are written in all CAPS. Built-in functions are implemented in native code and cannot be changed. They fulfill time-critical functions such as Bluetooth functions, external input and output functions, file-system functions, and others. The string index parameter is a substring parameter to the function. Each function has a particular parameter. nextsns This function schedules the reading of all internal sensors within the number of seconds provided as a variable. After taking the reading, the interrupt routine @SENSOR will be called. This happens only once. The next reading must be scheduled. "nextsns 0" turns this function off. sensor Returns the following five last-read values of the sensors to the string variable used in the assignment: AIO0, AIO1, temperature, RSSI-slave, RSSI-master. The analog values range from 0 to 1800. When the correction factors (@0008 in config.txt) are used, the values can be calibrated to the actual reading. It is usually expressed in millivolts, depending on the hardware. In addition, the temperature reading is placed into the string given as a parameter, and the relative signal strength indicators for the incoming slave connection and the outgoing master connection. Each number takes 5 character positions in the string: E.g. "0112 1850 27 1 -1"
pioin This function configures the port as an input. An expression (a number or a variable) specifies the port number. Port numbers 1 to 12 can be used. pioout Configures the port as an output. Port numbers from 1 to 12 can be used. pioset Sets the port active (high). If the port is configured as an input, it activates a pull-up resistor on that input. In addition "pioset 20" switches the LED on the AIRcable SMD on (pin LED1). pioclr Sets the port to inactive (low). You can clear the LED from the AIRcable SMD by doing "pioclr 20"
pioirq This function gets a string like "P00010000000". It starts with a 'P' and follows with '0' and '1' for the 11 available digital input pins. This function activates the input PIN to create interrupts when a change occurs. See @PIO_IRQ interrupt routine below. date This function writes a date string into the string given as a parameter, e.g., "20050531T192100Z"
reboot This function reboots the processor in 2 seconds. All connections will be terminated. uartcfg Configuration of the UART interface is coded in one integer value ranging from 128 to 255. The 8 bits are coded like this: 1PPSBBBB. For even parity, set 0x40; for odd parity, set 0x20; for two-stop bits, set 0x10. Baud rates are enumerated: 0 is 1200 baud, 1 is 2400 baud, 2 is 4800 baud, 3 is 9600 baud, 4 is 19200 baud, 5 is 38400 baud, 8 is 115200, and 12 is 1382400 baud. baud A simpler function that changes the baud rate of the UART to the baud rate specified in the variable. Baud-rate values are specified in 100-baud values, such as 96 for 9600 baud and 1152 for 115200 baud. e.g. "A = baud 96"
break The break command creates a break condition on the UART port. The TX line will be held low for a longer period of time. psget This command allows access to the configuration of the AIRmote devices as stored in the file config.txt. The argument is the key number as described in the config.txt file format. The result is placed in the string given that describes the configuration key in the same format. psset Enables writing to the configuration. Argument is the length of the string. The string that will be stored in the configuration must have the correct format to be successful. setdate Function to allow to adjust the clock. The string parameter contains a valid date string such as 20060123T085854Z. uartoff This function decouples the UART input from the BASIC input handler. If the UART port is connected to a streaming data source the system has to process the input even if no BASIC application receives the input. To improve performance, switch off the UART if not needed. uarton This function connects the UART input stream with the BASIC input handler system again. Normally these functions are not required, since the UART input stream is usually connected. uartint This function schedules a one time interrupt if data is received on the UART. The routine @UART is called. It is then the responsibility of the routine to read data and maybe reschedule the interrupt. No parameter. readcnt The AIRcable has an internal seconds counter you can read when ever you want. Once the counter reaches 32767 it will reset to -32768. The counter will be set to zero when zerocnt is called, on booting you can't determinate the counter state. You need to zero it manually if you want to use it. zerocnt Restart the internal seconds counter. lcd The AIRmote allows you to take control over some 8 chars 11 segments per char LCD panels. The OS all ready includes fonts, and has some special chars to have more control over what's displayed. The command to control what the LCD is displaying is lcd, this command takes an string as argument, and will replace the current display content with the string content. If the argument is null (A = lcd) then the display will be cleaned. All the characters will be displayed in CAPS. ". ": adds the decimal point to the previous character. ",": adds a coma to the previous character. NULL ( value equal 0): Will skip the char, and not delete the previous value. auxdac The AIRmote has an 8 bit DAC Digital to Analogic Converter integrated in it. It allows you to generate continuous current signals, with values that goes linearly from 0V to VBATT with 255 steps. ring You can connect a buzzer to the AIRmote and make it make some sounds by calling ring. Ring takes an argument from 0 to 100 allowing you to take control over the volume it makes the buzzer ring. A BASIC program can have one open file. A file name can be up to eleven characters long. The file system holds four files. open This opens the file and sets the file pointer to the beginning of the file. The parameter is a string that specifies the name of the file. append This opens the file specified but puts the file pointer to the end of the file. If the file does not exist, it will be created. close This closes the open file. If the file was overwritten at this time, the file system cleans up unused blocks and recalculates the size. delete The file specified will be deleted from the file system. The file must be closed before it will be deleted. erasefs This deletes the whole file system. All data in the files are lost. The files AIRcable.bas and config.txt are not erased. No parameter. exist Returns non-zero if the file with the name specified already exists in the file system. info This parameter is an integer from 0 to 3 specifying the index number of a file in the file system. The file's information (name, size, date) is put as a string into $0. load This function allows you to load a BASIC program from the file system into the BASIC interpreter. The parameter is the name of the file to load. Lines specified in the file will overwrite lines in the existing BASIC program. If @ERASE is in the file, the existing BASIC program will be erased. Otherwise, BASIC programs can be partially loaded using this function. Existing lines should be deleted when not needed, using just the line number and a space in the new file. read The parameter specifies the number of bytes to be read. The result will be placed into $0. The function returns the number of bytes read. A maximum of 32 bytes can be read. It returns zero when the end of the file has been reached. rename A file that has been opened can be renamed to the string given. It is only successful if a file with the new file name does not exist. seek Places the file pointer to the specified byte number in an opened file. size Returns the number of bytes the opened file contains. The file has to be opened. write Writes the number of bytes from $0 into the open file. It returns the number of bytes written. slave This function opens the Bluetooth device for incoming serial connections. The parameter specifies the number of seconds the port stays open. After that, the port closes again and the application has to call "slave" again. Note that the UART and the slave SPP port are not being connected automatically. Use the link command. As soon as another Bluetooth device successfully connects to this device, an interrupt routine @SLAVE will be called. the function "slave" now takes negative numbers. It means that the unit becomes undiscoverable for that amount of time. After slave makes a timeout @IDLE is triggered. You can call slave 0 at anytime to cancel @IDLE triggering, and to removes SPP register. Since OS version 30 special care is taken when the argument absolute value is 1: +1 or -1, in this cases the device is either registered to become visible (+1) or invisible (-1) but then after a timeout @IDLE is not triggered. dun This command behaves exactly as slave except instead of registering an SPP profile it registers a DUN (Dial-UP Network) profile. Both SPP and DUN behave exactly the same, but some cell phones and pda's can't connect to networks (like internet) over SPP. master Creates a connection to an SPP channel of another Bluetooth device. The parameter is the Bluetooth address as a string. When the connection is successful, the interrupt routine @MASTER is called. inquiry To find other Bluetooth devices in range, call this function. The parameter is the number of seconds the inquiry is active. When a Bluetooth device is found, an interrupt routine @INQUIRY is called. cancel This function is used in the inquiry-result interrupt routine to stop further inquiry results from being scheduled. link Use this to link either two of the three available channels together so they route data through. The parameter is a number that determines which channel to link. For example: 1 links the UART and the SLAVE channel, 2 links the UART and the MASTER channel, and 3 links the SLAVE and the MASTER channel for range-extender functions. unlink This function disconnects the channels. Use the same values to determine which one should be disconnected. disconnect This command disconnects one of the over-air connections. The parameter disconnects the SLAVE connection; non-zero disconnects the MASTER from the other Bluetooth device(s). message This function allows an OBEX vNote transfer to another Bluetooth device. The content of the string parameter will be placed in the BODY part of the vNote to be sent. The 12 digit Bluetooth address to where the message is sent is in $0 as a string. ftp This function allows the transmission of a file in the e2fs file system to another Bluetooth device. The parameter of the call is the file name on the remote device. The address to which the file is being sent is a string in $0. The file that is to be sent has to be opened by the e2fs open call before the ftp function call, the ftp command will automatically call close. This example sends a file called test.txt to another device. The file created there is named "from.txt"
91 S = open "test.txt"
94 U = ftp "from.txt"
modemctl To send a modem-control command to an active SPP connection, this function can be called in response to a change of the DTR input line on the AIRcable Industrial Male device. The value 0 as a parameter sets the modem-control, a 1 resets it. This command should not be used when two SPP connections are active. getaddr To receive our own Bluetooth address as a string in the $0 variable, call this function with no parameter. enable and disable Disable removes the FTP or OBEX record. It effectively disables the FTP and/or the OBEX server. Parameter is a bitmap. 1 is the FTP service. 2 is the OBEX service. 3 as a parameter means that both FTP and OBEX service are disabled . Enable enables the service records again. getuniq Gets a string parameter and prints the unique number into the first five characters of this string, with leading zeroes. shell When a slave connection was successful the user can start the BASIC shell. The BASIC shell is a command line interpreter that controls the BASIC program execution. The built-in function "A = shell" should only be used within the @SLAVE . The BASIC shell will echo all the chars it receives back to SPP, so there's no need to enable echo on your terminal emulator. unpair This function which removes the pairing information from a single Bluetooth address given or it removes all stored pairings when the parameter is 0. Note: the first paired device is considered the default device and cannot be removed individually. getconn Returns the address of the recent SPP connection to the BASIC program. The application can then find out who has connected. It can be used to do unpair or disconnect. status This function returns the state the Bluetooth processor is in. 5 states are defined and encoded into one decimal number. If an inquiry process is busy, 10000 will be added to this number. If a message transfer or an ftp transfer initiated by the AIRcable is in progress, 1000 will be added. If the device receives an FTP or a message, 100 will be added. If a master connection is established, 10 will be added and if a slave connection exists, 1 is added to this status number. This information can be used to determine when an operation is finished. As an example, this subroutine waits until an FTP transmission completes. success This function returns whether the last operation (ftp or message) was successful or not. If the return value is 1 then the operation was a success. It is -1 if an error occurred. It is set to 0 if a connection could not be established. name This command temporarily changes the user-friendly name of the Bluetooth device that is displayed during the inquiry process. The parameter is a string. The default is the configured name in the config.txt file, a space, and the unique 5-digit number generated. getname Returns the name of the confg.txt file device (Bluetooth friendly name) into the given string. Getname does not return the actual name of the device that has been changed using the name function. maxpower Allows the adjustment of the maximum RF output power for all communications. Normally this is set by the configuration parameter @0004 = 0000 0006.
bizcard This function sends a business card from an open file to another Bluetooth device. The argument given is the BT address. The file to send must be opened before. The contents should follow the OBEX specification of business cards. Some devices will not accept this if the content is not correct. The OBEX PIM item transfer for vCards will be used to send the content. dfumode This function will to put the AIRcable into firmware upgrade mode. The function is not available on all AIRcable OS products. Right now only the AIRcable Industrial support firmware upgrade. In addition on the AIRcable Industrial, when the security disable jumper is plugged in during reboot, the device will automatically go into firmware upgrade mode. Also the BASIC program will be erased. a2toi This function turns two number characters into an integer value. A string index variable as a parameter provides the start point. No termination is necessary. atoi This function turns a specified string into an integer. The limit is 16 bits. If the characters are not numbers - or during overflow - the result is zero. hex16 This function prints a variable given as exactly four hex numbers into $0. For example: if B contains 27, then A = hex16 B will print "001B" (in) the first four positions of $0. hex8 This function prints a variable given as two hex numbers into $0. For example: if B contains 27, then A = hex8 B will print "1B" into the first two positions of $0. strcmp This compares the given string with $0. The result is 0 if the strings are the same, -1 when the string is less than $0, and >0 if the string is greater than $0. If one string is shorter than the other, the string is compared against the substring. For example, "AIRmote 1234" is equal to "AIRmote". strlen This returns the length of the string given as a parameter. This command is useful when writing into the file system. x8toi This function turns exactly two hex numbers into an integer value. xtoi This function turns exactly four hex numbers in a string into an integer value. A string index variable can be used as a parameter. On the AIRcable Industrial (and other AIRcable OS based devices) a BASIC program controls the Bluetooth baseband processor. Since all operations (Bluetooth, BASIC, timer, etc.) are running on the same processor the device is implemented as a multi tasking system where several tasks perform operations concurrently. The BASIC program controls the multi-tasking system underneath it. The important programming principle is to keep the routines short. Routines should not occupy the processor for very long and then should end quickly. This allows the Bluetooth baseband processor to execute other tasks that are important in the functioning of the entire system. Routines that do not end (even with WAIT) will block the system. These routines are scheduled for execution either by the system automatically, by other parts of the program, by external hardware, or by Bluetooth events. Some routines interrupt the execution of other routines because they have a higher priority. For example, the @PIN_CODE routine has the highest priority and will interrupt any other routine. Otherwise, routines are scheduled to run after the current routine has finished. The BASIC interpreter is still running even when the Bluetooth device is connected or even when the BASIC Shell is running. When data is streaming through the data ports (linked SPP and UART), the BASIC program execution is slowed down. The timing may be affected by the program status. Routines are preceeded by @ and are Capitalized (for example, @INIT, @IDLE, @SLAVE, etc.). The line number of the start of that routine must follow the declaration. An interrupt is executed only in response to a specific event. The RETURN at the end of an interrupt routine does NOT execute the next line of written code. Instead, it releases the interrupt routine. Basically, they are subroutines that end with RETURN. @ALARM Alarms can be scheduled from the BASIC program using this routine. After a number of seconds are specified in the function, this interrupt routine is executed. @CONTROL This routine will be executed when there is a modem request through the SPP interface. If the RTC bit is set in the message, the character '1' is put into the string $0. If it is clear, a '0' will be in the first place of $0. @FTP Whenever a file is received over FTP, after the file has been received @FTP will be triggered. The name of the file is the name provided by the item sender. If the name is longer than twelve characters, the part before the '.' will be shortened to eight characters. @IDLE After @INIT finishes, and each time the slave channel close (because the connection was lost, or because there was no connection request), the idle routine is running. @INIT This is the routine that runs when the AIRmote starts up. This routine initializes the digital input and output lines. It may also trigger an alarm to blink the LEDs. @INQUIRY Every time another device is discovered during the inquiry process, this routine starts up. The result of the inquiry is in $0. It starts with the Bluetooth address followed by the name of the remote device. The name starts at $0. @MASTER The master routine is running when an outgoing connection request is successful. @MESSAGE Whenever an OBEX item is received, the item is stored in the file system. The name of the file is the name provided by the item sender. If the name is longer than twelve characters, the part before the '.' will be shortened to eight characters. @PIN_CODE Whenever another Bluetooth device requests a connection, a PIN code must be supplied. The Bluetooth address of the device that requests the PIN code is $0. This BASIC routine returns the PIN code that the other Bluetooth device must use in $0. @PIO_IRQ Digital input lines can be configured to create interrupts when the status is changed (See building function: pioirq.). This routine is started with the status of all digital input lines in $0. They are represented as a string, "P00010000000", for example. @SENSOR When a reading is done, the interrupt routine is called with the result in the string parameter given. The reading consists of the corrected analog input in millivolts, the temperature in degrees Celsius, the relative signal strength of the slave SPP connection, and the RSSI of the master SPP connection, if present. @SLAVE As soon as an incoming connection is established, the slave routine starts up. @UART This routine is scheduled once when the uart interrupt is enabled via "A=uartint" and data is received on the UART port. @ERASE An instruction @ERASE at the beginning of the file will insure that all previous code is removed before the new program is uploaded. If not present, the BASIC lines in the new uploaded code will be overwritten but lines not present will not be erased. @UNPAIR On upload of the BASIC program this will instruct the device to remove all pairing information stored from previous successful connections. The following two special commands do not require line numbers. They can be put at the first line of the BASIC program. The AIRcable Industrial knows 5 program-controlled, scheduled routines. And 5 hardware or event scheduled routines. After the AIRmote has started and run through its @INIT routine, @IDLE will be called. Normally you would open up the incoming serial connection port with the 'slave' command. The 'slave' command terminates immediately but leaves the port open for a number of seconds. If no connection was established, @IDLE will be called again. @IDLE is also called when a slave connection closes. Alarms (with the ALARM command) can be scheduled to have the routine @ALARM called within a number of seconds. The sensor reading scheduler which is started with the 'nextsns' command, can also be used for scheduling application execution. In the @SENSOR routine the next sensor readings can be scheduled. See examples below for application execution scheduling practice. The following interrupt routines interrupt the BASIC program execution: pair request, inquiry result , message and alarm. All other routines are scheduled for execution after all other scheduled tasks are completed. The AIRcable OS devices have a BASIC command-line interface on the slave SPP port. The BASIC shell allows the interactive start of BASIC routines and call-building functions. It can also be used to change, add, or delete BASIC program lines, it is also very usefull for debugging as you can check the code inside a routine with out the respective interrupt. To log on, open a Bluetooth connection to the SPP port of the AIRcable device. When the connection is established, the @SLAVE routine starts up. In this example, there is a wait of 3 seconds for a '+' and an ENTER to start the interactive shell (otherwise it would link the SPP channel to the UART channel). When the shell is activated, the system responds with a command prompt: "TAG$." 300 PRINTS "type + for shell: "
RUN 40: Starts a BASIC program at that line. LIST: Prints the BASIC program to the console. PRINT $1: Prints a single line of BASIC program, line number 1 in this case. VERSION: Prints the version number of the AIRmote device. FILES: Lists the files in the file system with name, size and date. A command starts with a line number, followed by a space and the BASIC command line that should be stored at this line number. Any string up to 32 characters long can be typed in. This is used for string variable initialization and BASIC program code. A line number with a single space following it deletes the line. Built-in commands can be called by typing the function name in lowercase letters. No variable assignment is possible like the use of build-in function in the BASIC code. Functions have three different types of parameters, as listed be fore: no parameter, one variable, or one string. The interface here is more limited than the BASIC execution engine. For example, the string parameter can be "$4" with one space after the command. No expression evaluation is performed. It can be an immediate string starting after one space without any '"'. The variable is a BASIC variable. Only one letter in caps is allowed after the space. Due to system size little error checking is performed. In case of a system crash that leaves the device inoperable, use the security overwrite feature in hardware that stops the BASIC engine and keeps only the FTP and OBEX server ports unsecurely open. Expression complexity is limited. The recursive parser can overrun stack space, which causes the system to reboot. If a BASIC program stack overflow occurs (for example, too many interrupts scheduled), the AIRcable OS will delete the BASIC program from memory and will go into an unprogrammed state. The PIN code specified in the "config.txt" file is now the active security information. The special BASIC variable Z can be used for debugging the BASIC code. If Z = 1 the lines the BASIC interpreter executes are printed on the UART. If Z = 2, it prints to the slave port, if Z = 3 it prints to the master SPP port. This is very helpful to understand what's going on in a system where external events trigger the execution of the BASIC code. 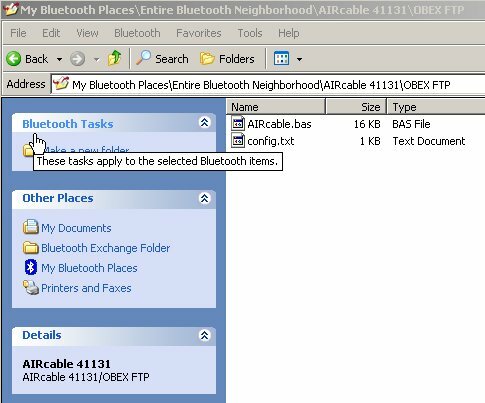 The standard slave program allows other Bluetooth devices such as cell phones, Palmpilots, PDAs, laptops, and PCs to connect to the Bluetooth serial profile of the AIRcable Industrial. To program the AIRcable Industrial with this new program see Programming AIRcable OS. This simple slave program demonstrates some of the routines and how to program the AIRcable Industrial. We will first explain you each part of the code, and then will show it as hole so you can see it and try it. We had divided the code in 3 parts, and each one is controlled by a different interrupt. First part is device intialization, as any embeded solution when the device turns on there are other devices that needs to be initializated, in this simple example we will turn on a LED and intializate the RS232 port, but you can do more complex tasks like for example initializating a Display, a GPS device, or what ever you have connected to the device. Second part is slave channel manipulation this part will open the slave channel and blink a LED to show that the code is running. The third and final part is slave connection managing this part of the code will accept all the incoming connections, let the user choose between the Shell or RS232 connection, and will turn on both leds. There are other routines that we handle on this code, which are not exclusive necessary for an slave connection, but we include them to show how the real code should look like. The slave program starts with @ERASE. This is a command to the BASIC loader in the AIRcable when a new program is transmitted via wireless FTP. It will cause the AIRcable to erase its BASIC memory completely. The first routine is @INIT, it runs only once when the system is booted or a new BASIC program has been uploaded. In the following example the green LED is first switched on to indicate that the AIRcable boots. The lines 12 to 19 configure the power to the RS232 level shifter and schedule a hardware interrupt on PIO4, this is DSR input on the RS232 connector. This part of the code will open the slave channel to accept incoming connections, and will put the device in discoverable mode. The interrupt we are going to use is @IDLE as it is called when ever there is no bluetooth activity, that means whenever the slave channels closes this can be due to slave connection timeout or lost of a slave connection. This routine will also be the first one to be called as soon as @INIT ends. The BASIC program opens up the incoming serial slave port (SPP) for a number of seconds (A = slave 5) and then exits immediately. The serial slave port (SPP) stays open for other Bluetooth devices to make connections. If a negative value is being used (for example, A = slave -5) the AIRcable Industrial will not be discoverable during this time, and until slave is called again with a possitive value, in this case other Bluetooth devices must know the address to be able to make connections. When a connection to the slave port is successful, meaning another Bluetooth device has initiated a connection to the AIRcable, the @SLAVE routine starts up. The BASIC program can find out who is connecting using the built-in function getconn (for example, A = getconn $0). For a simple slave application the program would link the wireless SPP port to the UART. This routine allows also user to start an interactive session with the built-in shell. When a '+' and an enter is typed in immediately after the connection has been established the AIRcable Industrial starts with a BASIC interpreter shell. It is possible to change lines of the BASIC program, start or stop routines, print variables and call built-in functions. A successful connection requires that the two partners are paired. PIN code is exchanged and then a unique link key is stored on both ends to indicate a successful pairing. The pairing information is stored persistently for future connections that will no longer need a PIN code. Pairing information can be erased, when more than 8 peers are stored, or manually with the unpair function (single peers), or the @UNPAIR command (all peers) at the beginning of a BASIC program upload. The PIN code that is used for all connections (slave, master, ftp and obex) is configured here in the BASIC program. This way, the application has more control over security. When @PIN_CODE is called, the Bluetooth address of the device requesting connection is available in the $0 string variable. This variable is being used for the PIN code response as well. The last 2 routines @PIO_IRQ and @CONTROL deal with the handshake lines on the RS232 ports. If the DSR input on the DB9 connection changes, @PIO_IRQ is called. This was already initialized with the earlier instruction "A=pioirq "P00010000000" in the @INIT routine. The function modemctl transmits a message through an established SPP connection to the other end. Receiving this message will schedule the @CONTROL routine to be executed. In this example we set or reset the DTR pin of our RS232 connector. This section of the programming handbook describes the implementation of a serial port profile master program for the AIRcable Industrial. It serves as a good example of how to debug wirelessly. While the AIRcable Industrial is finding other Bluetooth devices and streaming data, it is still accepting slave connections. We use the second wireless serial port (the slave SPP) for debugging. Make a SPP connection to the AIRcable and run a terminal emulator (such as Hyperterminal) on the connected slave SPP port. The BASIC interpreter will write every BASIC line it executes and debug any strings the BASIC program writes to the slave port. This is independent of the data communication between the peer Bluetooth device connected through the master port and the UART. On the AIRcable Industrial (and other AIRcable OS based devices) a BASIC program controls the Bluetooth baseband processor. Since all operations (Bluetooth, BASIC, timer etc) are running on the same processor, the device is implemented as a multi-tasking system where several tasks perform operations concurrently. The BASIC program controls the multi-tasking system underneath it. The important programming principle is to keep the routines short. This means that routines should not occupy the processor for very long and then it should end quickly. 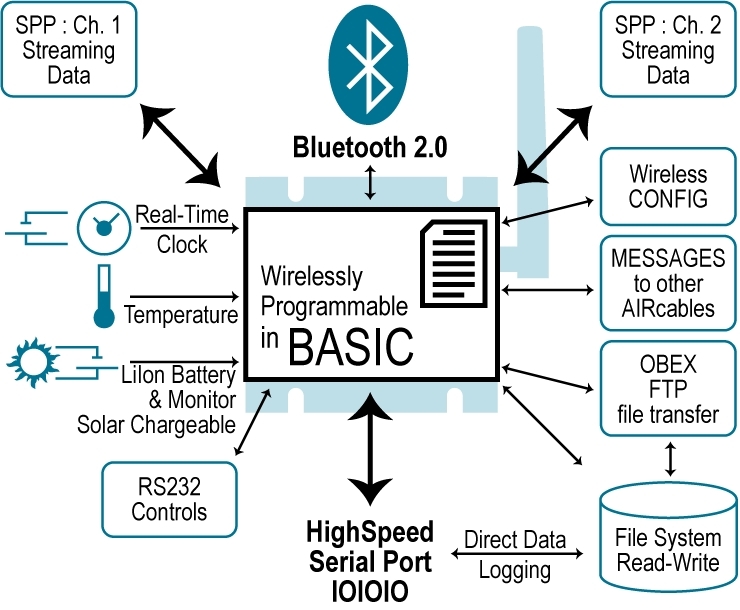 This allows the Bluetooth baseband processor to execute other tasks that are important for the functionality of the whole system. Routines that don't end (even with WAIT) will block the system. These routines are scheduled for execution either by the system automatically, or by other parts of the program or by external hardware or Bluetooth events. Some of the routines interrupt the execution of other routines because they have higher priority. For example, the @PIN_CODE routine has the highest priority and will interrupt any other routine. Otherwise routines are scheduled to run after the current routine is finished. The implementation of the master program will serve as an example of the various routines available. The master program starts with @ERASE. This is a command to the BASIC loader in the AIRcable when a new program is transmitted via wireless FTP. It will cause the AIRcable to erase its BASIC memory completely. As the other example (slave code), we had divided the code in several parts so it is more easy to understand. The first routine is @INIT. It runs only once when the system is booted or a new BASIC program has been uploaded. In this example the green LED is first switched on to indicate that the AIRcable boots. The lines 7 to 19 configure the power to the RS232 level shifter and schedule a hardware interrupt on PIO4. 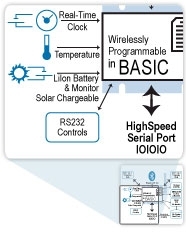 This is DSR input on the RS232 connector. The PIN code that is used for connections (slave, master and ftp) is configured here in the BASIC program. This gives the application more control over security. Communication is only with devices with a friendly name starting with "PUMP" the string variables are initialized here as well. Debugging is switched on using the special variable Z. A value of 2 means to send debugging to the slave port. The state engine is initialized and any pending wireless links are disconnected. This is helpful when changing programs frequently without rebooting the AIRcable. Slave ports are not disconnected so that the initialization execution on the slave port can be determined when a new version is uploaded. @IDLE is called whenever a slave connection is not available or when a slave connection closed. This routine starts right after @INIT. Normally the BASIC program would open up the incoming serial slave port (SPP) for a number of seconds and then exit. It will be called again when the time is up and no connection was established. At this time the BASIC program will again open up the slave port for incoming connections to SPP. When a connection to the slave port is successful, meaning another Bluetooth device has initiated a connection to the AIRcable, the @SLAVE routine starts up. The BASIC program can find out who is connecting using the built-in function getconn. A successful connection requires that the two partners are paired. PIN code is exchanged and then a unique link key is stored on both ends to indicate a successful pairing. The pairing information is stored persistently for future connections that will no longer need a PIN code. Pairing information can be erased either when more than 8 peers are stored or manually with the unpair function (single peers) or the @UNPAIR command (all peers) at the beginning of a BASIC program upload. In a simple slave application the program would link the wireless SPP port to the UART. Fundamentally, this example does the same. In more complex master examples the program allows master and slave connections at the same time. Basically there are three ways to achive this: a state machine allowing the Bluetooth baseband processor to do master connections without conflicting with the slave connections, scheduling @ALARM interrupt and checking for Bluetooth status with A=status, and the final is a combination of the two you do have a state machine, but you still check the Bluetooth activity to be more secure. In this simple example we will use an state machine, but if you want to see a combination of both we strongly recommend that you read the developers manual on command line implementation - COMMING SOON. The states are as follows, with the variable X used to keep state. 0. State is initial state. Looking at the @IDLE routine, slave connections are only allowed when inquiries are still going on, or when a master connection has been established. When the slave connection mechanism is scheduled while a master connection is being established it causes conflicts. @IDLE will return in those cases and will have to be rescheduled when a certain state is reached. The @MASTER routine is called whenever a master connection is successful. This is the second program-controlled, scheduled routine. The routine is simple. It configures the UART with 9600 baud and odd parity and links the SPP master port to the UART. We also store the address of the peer in $4(if connection is lost, reconnect to this address first before starting the inquiry process). Since a longer master connection timeout has been scheduled (20sec), a quicker alarm should be rescheduled. Use the ALARM scheduler as the main control mechanism to control the whole application. All execution is initiated by @ALARM, depending on the state described above. Because inquiries are expensive in processing time and in power consumption, wait when inquiries are occurring. Leave the processor as much time as possible to do inquiries. The results are scheduled by calls to @INQUIRY. Inquiry routines are sensitive to interrupts by other inquiry results. To prevent interruption a semicolon can be placed after a BASIC instruction. Normally the BASIC interpreter executes one line of BASIC program and then allows other parts of the system to execute before it goes to the next line. At the moment it schedules the execution of each line for every 100ms. With the placement of the semicolon this wait does not happen, the BASIC interpreter executes the next line immediately without going back to the scheduler. Use the semicolon carefully. As for @ALARM, a standard state engine switch is at the beginning and fans out from there to the different procedures depending on the state. Note that in every state we reschedule another ALARM within a few seconds to keep the system running. Switching state forward is mostly done in these procedures. 0 REM set state to "connecting"
The function modemctl transmits a message through an established SPP connection to the other end. When the message is received it will schedule the @CONTROL routine to be executed. This example sets or resets the DTR pin of our RS232 connector. Debugging is much easier since version 24. A special variable Z is used to switch on debugging of the BASIC interpreter. Every line it executes is printed on one of the 3 data channels, UART, SPP-slave, or SPP-master. We use the SPP-slave port to send the BASIC lines executed and additional debugging information. The debugging code in the program makes sure that data is not sent to a channel that is not connected. The AIRcable will buffer some data when there is no connection, but it will reduce memory and cause unnecessary processing. Note: This is the entire program, with debugging switched on. To use the program in production without debugging, change line 26 to "Z = 0". Writing interactive programs can be challenging because the BASIC program can block the execution of other parts in the system. For example, the INPUT functions will hold the BASIC program at that line. If an interrupt occurs (sensor alarms, PIN code requests, etc.) the request does not get fulfilled until the INPUT times out or finishes. The slave function opens the Bluetooth SPP port for incoming connections for a specified time. The function itself returns immediately allowing other operations to continue while the system accepts incoming connections. After this time, the @IDLE routine will be started again. The @IDLE must return before that happens. The following example allows the reading of a command from the UART while the system is idle (or accepting incoming connections). Note: timeout expires before slave expires to restart @IDLE. This is the approach we had taken in our Command Line software. In this last section we will show you some code fragments that you can use as a reference. This fragments will not work out of the box, you will need to make some changes to them in order to use them, but can be used as a reference to see how to do some things. This example shows the use of the MultiSensor from iButtonLink.com. It logs temperature and humidity into the file system for later download. 71 S = append "tmplog.txt"
This example reads binary data from a gas sensor, converts it into a string and sends it via an OBEX vNote to another Bluetooth machine every 10 seconds. 64 REM C = message "0013105D4CAC"
65 C = message "000B0D04B695"
This is a version of the program that reads the sensor and puts the data in a file, then FTPs the file over to another device. 58 S = open "sensor.sns"
91 S = open "sensor.sns"
92 REM $0 = "0013105D4CAC"
94 U = ftp "FromSEE.sns"
This initialization routine logs the date into a file when the system boots up. 30 A = append "bootlog.txt"
52 A = exist "bootlog.bak"
54 A = delete "bootlog.bak"
55 A = rename "bootlog.bak"
57 A = open "bootlog.txt"
This example shows how to break an incoming data streaming connection within a certain period of time. 304 PRINTS "connected for 30s\n"
This example shows the capture capabilities to log UART serial data directly into the file system. 250 S = open "log.txt"
255 PRINTS "done, size "
This test routine sends a file via FTP to another Bluetooth device, such as a PC, laptop or Palmpilot, discovering the other device via an inquiry process, and is named "PALM2". 103 C = strcmp "PALM2"
107 C = open "vCard.vcf"
109 C = ftp "fromair.vcf"
500 PRINTS "msg received "